The Juice Fountain Cold is Breville’s answer to the low shelf life of juice extracted from centrifugal juicers. It comes equipped with their proprietary Cold Spin Technology and Elevated Juicing System. Normally, juice coming from high-speed juice extractors only last for 24 hours but Breville BJE430SIL overcame this limitation. The kitchen equipment juggernaut claims that your juice can last for three days with this innovation. Your standard high-speed juicer collects the juice at the base of the chamber, close to the motor. Prolong usage may cause this area to build up heat. This degrades the quality of the juice along with other external factors such as exposure to light and oxidation. With the Cold Spin Technology, the juice doesn’t touch the base of the juicing chamber at all. It flows up leading to the spout, thus preventing heat exposure. The Elevated Juicing System further preserves the quality of the juice by slightly positioning the spout above the cutting disk and through its unique juice jug design. Apart from collecting the juice, it’s also a great (semi-airtight) pitcher. This can come in handy when you’re preparing for a 3-day juice cleanse. Now let’s get back to the details. This electric juicer is quite similar to The Juice Fountain Plus which has a dual-speed setting and it also comes with a standard 3-inch wide feeding chute. The difference lies in the larger pulp container and the new technology that keeps nutrients, minerals, and enzymes alive in your juice. For the record Juice Fountain Cold is the only centrifugal juice press on par with cold press juicers. This fast juicer is a breeze for those with little time in the morning. Most oversized produce, like apples or cucumbers, will not need to be cut before juicing. Just make sure to wash them and remove the stems or leaves, etc. This juicer is easy to assemble. Before juicing, you will have to snap the safety arm into position; otherwise the machine will not turn on. Juice Fountain Cold is loud once you begin juicing, but it takes only a couple of minutes to complete the entire process. Place your items into the feed chute and use the food pusher to lightly push them through the cutting disc. It is a gentle process to feed the produce through the juicer. When juicing greens, it is a good idea to either tightly roll them or wrap them around something hard, like a cucumber. After a couple of minutes, everything should be complete, and you can enjoy your freshly prepared juice. Almost everything on the Breville BJE430SIL is dishwasher safe, but only on the standard setting. The only exceptions are the juice cover, juice jug, and sealing lid. These must be washed by hand, rinsed, and set out to dry. Rinsing and placing everything in the top rack of the dishwasher literally takes about 30 seconds. Take the cleaning brush and scrub the pulp out of the stainless steel micromesh filter basket before placing it into the top rack of the dishwasher. Be mindful of the sharp blades. The juicer base can be wiped down with a clean rag. When you have more time, take advantage and wash everything by hand as that is always recommended to help extend the life of your juicer parts and accessories. You can also minimize cleaning by placing a biodegradable bag into the pulp container to catch the pulp. The new technologies that Breville introduced in this juicing machine are geared toward prolonging the shelf life of your juice and improving the juice quality overall. Since centrifugal juicer’s inception the low shelf life was a bit of an issue for most including me and to date I would still prefer a masticating juicer over a centrifugal one. However, this improvement caught my attention, I was so interested in the Cold Spin Technology and the Elevated Juicing System Breville was raving about. Since it’s a high speed juicer, oxidation is still at significant levels and they won’t be able to change that. To extend the shelf life of the juice from 24 hours to 72 hours, they thought of a way for it to be stored right away. You’ll notice that the juice jug of Breville BJE430SIL looks like a standard pitcher. Once you finished extracting 70 fl. oz of highly nutritious juice, just twist the lid of the juice jug then store it in the refrigerator. This will help you preserve all the nutrients, enzymes and minerals in your juice for about 72 hours. What Kinds of Produce Can Breville Juice Fountain Cold Juice? Hard produce includes bitter gourd, pineapple, broccoli, pumpkin, cauliflower, watermelon, garlic, pear, sweet potato, beets, ginger, apple, cucumber, celery, pepper, turmeric, yakon, carrots, fennel, cilantro and asparagus. Citrus fruits include lemon, tangerine, grapefruit, mandarin, lime and orange. Using a low speed setting can process soft fruits such as grapes, blackberry, mango, papaya, pomegranate, strawberry, melon, avocado, tomato, cranberries, peach and kiwifruit to make a puree. Thus, it’s not advisable for juicing any of the following—collard greens, cabbage, peppermint, kale, romaine lettuce, beet greens, spinach, dandelion greens, parsley, pine tree needles, wheatgrass, basil, lettuce, spring onion, brussels sprout and moringa. If you really want to juice greens with your juice fountain cold, process it along with hard fruits and vegetables. Some even suggest to place it between hard produce like a sandwich or roll it in bundles but that won’t yield as much juice as cold press juicers. The ultimate selling point of this juicer is the 72 hour juice shelf life and I can assure you that nothing in the market comes close to it as far as centrifugal juice extractors are concerned. However it shares the same weakness with high speed juicers, it doesn’t work that much for leafy greens but if your juicing routine consists mainly of fruits and hard produce then this shouldn’t be an issue. The price tag on it is lower than many of the other fast juicing machines out there, which makes it attractive to those on a budget. The only real complaint surrounding the Breville juicers is the one-year limited product warranty. 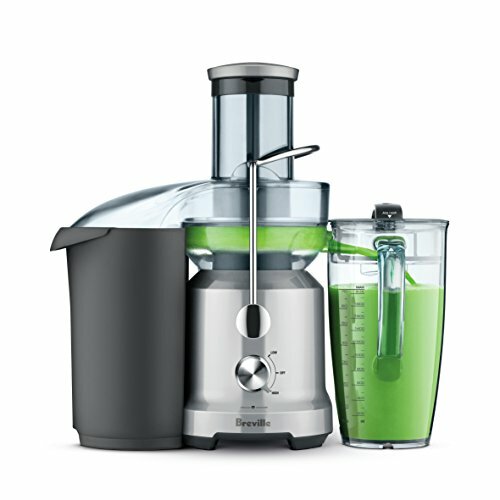 Otherwise, this is a good juicer to purchase. If you are looking for a centrifugal juice extractor, that isn’t going to break the bank, yet still delivers delicious and nutritious juice, then the Breville Juice Fountain Cold BJE430SIL is probably a good option for you.